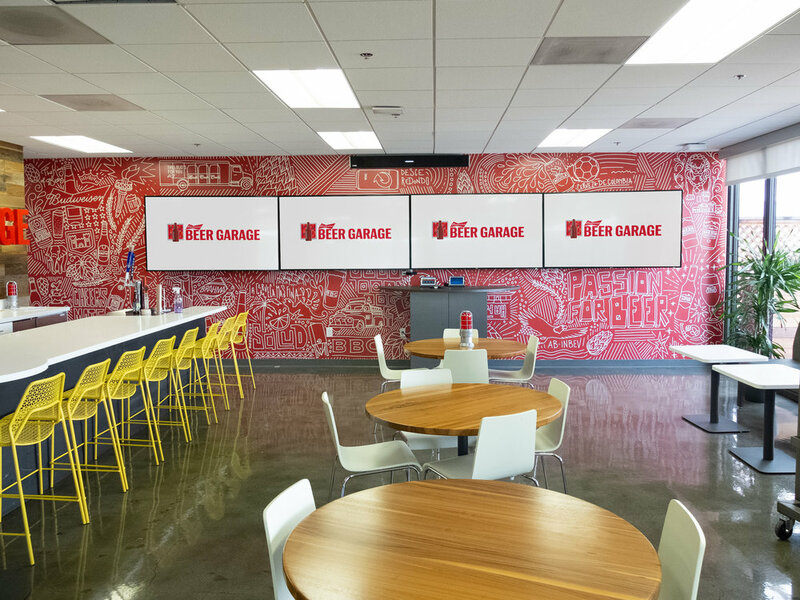 Since our work with Budweiser (AB InBev) at SXSW 2016, Pro-Ject has continued supporting AB InBev in bringing the Beer Garage to life in the heart of Silicon Valley. The Beer Garage, ABI’s in-house tech innovation lab, focuses on leveraging new technologies to better serve the needs of consumers, partners, customers and “beer lovers around the world.” The Beer Garage is also responsible for scaling ABI’s capabilities in artificial intelligence, cloud technology, data analytics, automation & robotics, AR & VR, Blockchain and more. Since 2016, we’ve partnered with Interiors for Business to design a functional workspace that emulated the decor and vibe of our award-winning SXSW Beer Garage experience. Using our event production best practices and activation decor experience, we incorporated stickwood finishings on the walls, polished concrete floors, butcher block work tables and a functional garage door which can divide conference room space into two separate rooms or one larger collaborative space. The bar has ABI’s portfolio of beer on tap of course, and four flat screen LED TVs can host presentations, or stream the game for office hang outs. The office space has been open and operating since Spring 2016. Check out our tweet that shows off a few photos. Throughout February/March 2019, Pro-Ject partnered with Chicago’s 12 Line Studio to bring additional creative flare and innovative technology to the space. 12 Line’s Founder/Creative Director Nate Azark and his team ideated and designed three custom murals to tie the space together. Murals in the kitchen and collaboration space feature AB InBev’s diverse portfolio of beers from around the world. A mural in the entryway of the space is complimented by the use of augmented reality that gives a unique interactive look at ABI’s brewing processes. This technology inclusion into the Beer Garage workspace gives customer and partner visitors from around the world a memorable experience and further speaks to AB InBev’s commitment to include innovative technology as a part of the future of their business. For more information about AB InBev’s Beer Garage head to AB-InBev.com.